FutureServers Review 2019: Is FutureServers a Good Hosting? For fast and consistent hosting or custom reseller and dedicated server solutions, it’s worth checking out what U.K.-based FutureServers have to offer. 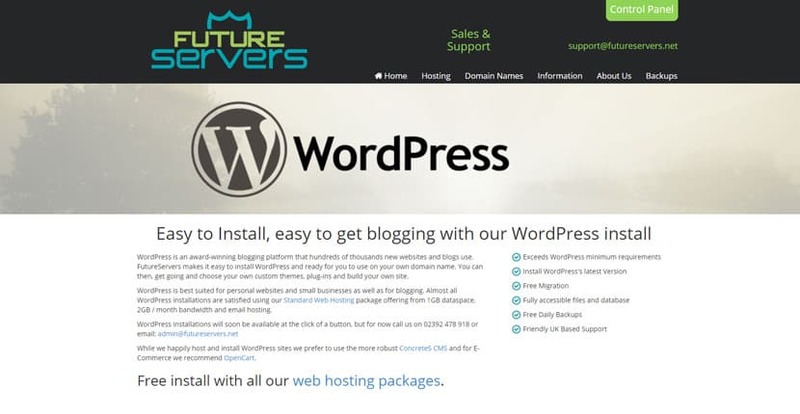 FutureServers is a new and expanding web hosting company that’s based in Middlesex, England. For now, they prefer a one-on-one approach whereby customers contact them with regards to a hosting solution and they set it up for you. Low Load Hosting: Their Lo-Load hosting plans provide better consistency in terms of performance as the likelihood of your servers being overwhelmed with traffic is far less likely. With these plans, you’ll be hosted on shared servers with no more than six other users. FutureServers provides a nice range of software that will make hosting almost any type of website a comfortable and familiar process. WordPress, Concrete5, and OpenCart can be installed for you. Unfortunately, they don’t offer any convenient one-click installers or website builders at this point, so they’re not the most beginner-friendly option out there. Furthermore, because you can’t customize a hosting package or purchase a pre-made one directly from their website, certain users will find their service rather cumbersome. You’ll have to contact and wait on their support team for everything. There are also a few glaring issues with their packages: namely, backups aren’t included by default. If you want backups, this will be an additional fee — and quite a hefty one at that. You also won’t have the assurance of any uptime guarantees or SLAs with FutureServers, disappointingly. FutureServers provide mostly shared web hosting services with a few types of hosting tailored for various uses and three dedicated server options. Their packages are steeply priced, particularly when you consider the lack of features and resources allocated. Unfortunately, they don’t offer any refunds or trial periods, and you’ll be locked into your contract term with them. Web Hosting: It’s unclear whether this package comes with a control panel, but they do offer you your choice of CMS: WordPress, OpenCart, or Concrete5. Email hosting is also provided. Lo-Load Hosting: These servers ensure that you share resources with no more than six other customers to increase the share of resources going to your hosting. Contracts are a minimum of six months. Unlimited email hosting is included. Dedicated Servers: You can purchase the three available standard servers or configure your own. Monthly, quarterly, and yearly billing terms are available. You’ll be charged in advance for the use of these servers. Reseller Hosting: These solutions are provided on an individual basis after a consultation. When it comes to technical support, FutureServers is definitely not the best out there. The only “guarantee” they give is that they will try to reply to queries within the same day or the next if made after 4 PM. They are also still busy putting together an FAQ and knowledge base. For now, they recommend contacting third-party support specialists with any queries, which can be expensive and is not ideal. Their support isn’t bad if you actually receive it, but you might need to wait for a considerable amount of time. Although they provide some interesting and unique hosting solutions, the lack of support and features provided by FutureServers is a major concern. If you require a lot of support and advanced features, you should look elsewhere. Wondering how FutureServers stacks up against other Web Hosting companies? Enter any other Web Hosting company and we will give you a side-by-side comparison.